I'm always a sucker for magical books within books (twice the bookish fun for the reading! 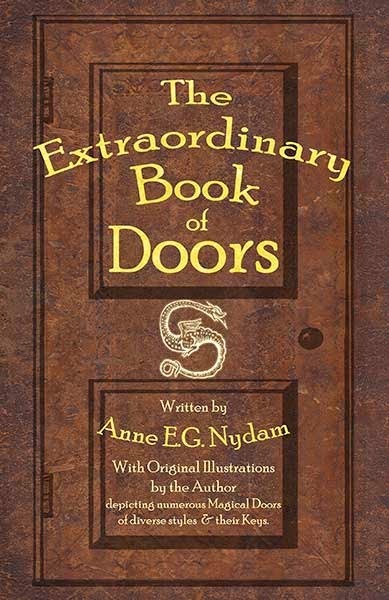 ), and the 16th-century tome that gives its name to The Extraordinary Book of Doors, by Anne E.G. Nydam (Createspace, 2014), is a lovely one indeed, opening up fantastic adventures for two ordinary kids. It begins with Chen Connolly finding a copy of Serlio's Extraordinary Book of Doors seemingly abandoned beneath a park bench in Cleveland. The book is what it sounds like--Serlio was a tremendously influential Renaissance architect, and this book is essentially a illustrated catalogue of doors. But the book is magical. The embossed key on the cover detaches, allowing Chen to travel through the doors to the buildings that wait inside them. And at the same time, a quirky girl named Polly in Massachusetts comes upon a second copy of the book, one that belonged to Benjamin Franklin. Her book and key work the same way...but on the backs of each door, Franklin has left cryptic clues--and if they can be solved, they'll provide the information needed to claim a bequest Franklin established during his lifetime to be used for humanitarian and educational purposes. It is an absolutely lovey premise, made even more so by the black and white illustrations of doors drawn by the author (some based on Serlio's doors, some imaginary) included throughout! And it's an exciting adventure, too, given depth by the friendship, at first uncertain, that grows between Chen and Polly. It's a good one for kids who like heist stories that come with magical twists. By the end of the book, the magical exploration of the doorways is secondary to the danger posed by the rival treasure hunter, with the excitement of outwitting him (by the skin of their teeth) and solving the clues taking center stage. Do not be deterred by the fact that this is a self-published book--I noticed no infelicities of editing (such as are found, all too often, here at my own blog; sigh). Bonus: Chen is adopted, presumably from China (his given name is a Chinese surname, sometimes used in the US as a first name) making this one for my list of multicultural speculative fiction books. Secondary bonus: probably I was taught about Serlio somewhere back in the day, but I'd forgotten about him. I feel better educated now. I also feel like drawing doors. disclaimer: review copy received from the author. Oooh...I'm a sucker for stories about magic doors, and this sounds delightful! Her prints -- or, blockprints are just fab -- and that she wrote a story on top of that is kind of staggering. Perhaps she self-pubbed because the process is time-consuming and she just wanted the book out and shared - to that end, I hope many others find it. It's lovely looking! I've now read it and love it. Highly recommended. If self-publishing is a detriment, does anyone know an agent who might approach Ms Nydam?